Happy Tuesday, friends! Phew, it’s been a crazy couple of weeks of traveling. I can’t believe it is already October. September passed so quickly because I was gone nearly the entire month. It was an eventful one though. Celebrated my 28th birthday, was a bridesmaid in my childhood best friend’s wedding, spent 10 days in Spain, and then ended the month with a girls weekend in Vermont with Vanessa from The Cheeky Been. I didn’t even have a chance to share my entire Spain trip with you before repacking my suitcase for a Fall getaway in Vermont. I had an absolute blast with Vanessa. She’s the kind of friend that you swear was your sister and you simply were separated at birth. We are so silly together that I’m sure we entertain everyone around us through our crazy adventures. If you ever find a friend like that hold. on. tight. I’ll be sharing more from Vermont and all the details where we stayed in an upcoming blog post so stay tuned! Today’s look is one I shot in Spain while exploring Barcelona. 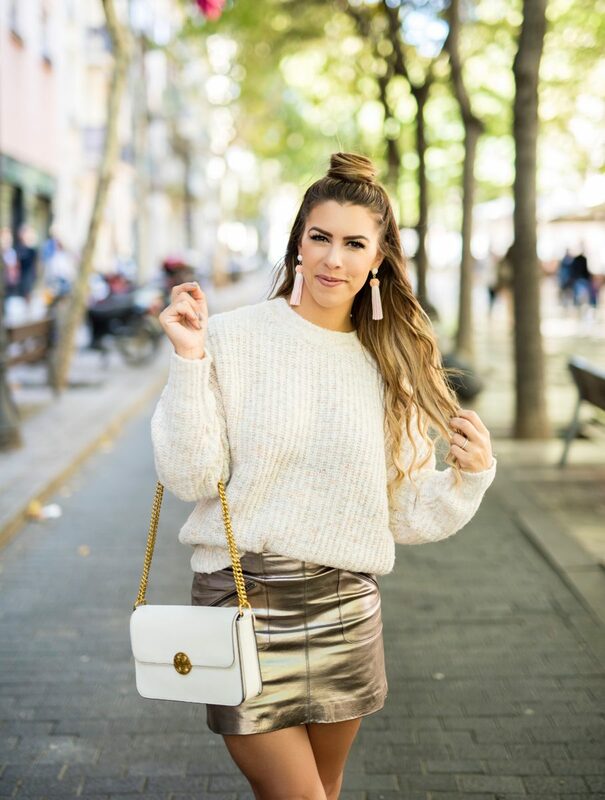 The weather there is a bit chillier than Charlotte so I opted for a bulky sweater paired with a metallic skirt. 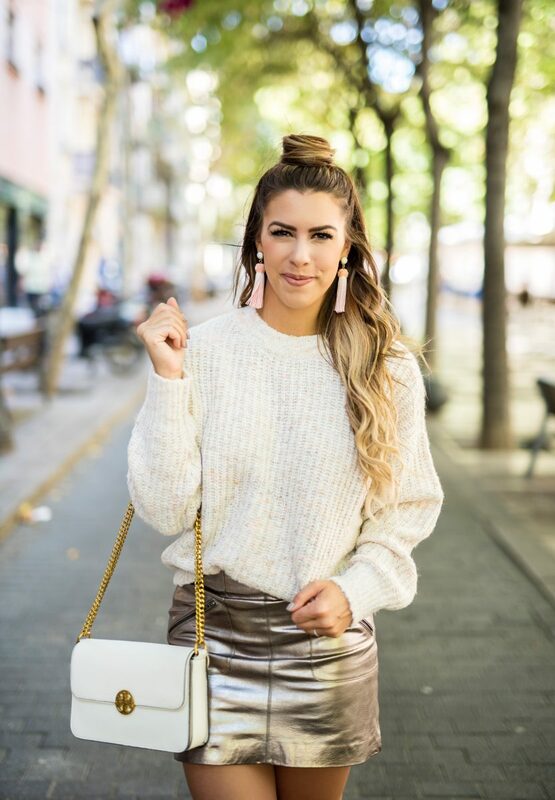 Metallic seems to be trending a lot in fall clothing lately. I’ve seen it on jackets, shoes and pants as well. I think it’s best in small doses since it is such a statement texture. The day I wore this, Drew and I wandered across the most amazing creperie shop while sightseeing. We didn’t hesitate to grab some dessert and an irish coffee to relax in the middle of an open-air courtyard. It was amazing. I absolutely love the European lifestyle. They always take the time for a good mid-day siesta. Can we adopt that? Shopbop Sale Faves – Up to 25% off!